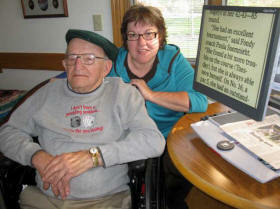 October 2011 -- The Fond du Lac Evening Lions Club placed two optical readers recently in homes of Fond du Lac residents. Dolores Kind of 245 N. Macy St. and Alvin Daun, formerly of 283 Riverlane, St. Cloud, who is residing at the Hospice House on Cty. Hwy K are the recipients. Both Kind and Daun expressed their appreciation to the Lions who delivered the readers as both stated that they can now read the daily paper which they missed reading due to their failing eyesight. 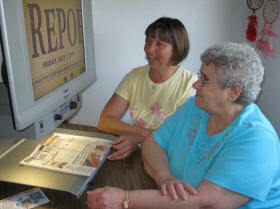 Pictured are Rose Siedschlag, left, daughter of Dolores Kind. The other picture is Judy Goebel, daughter of Alvin Daun.